We know it when we feel it: School spirit warms a school, makes everyone smile, and brings people together. It makes everyone feel that they are part of something greater than themselves. 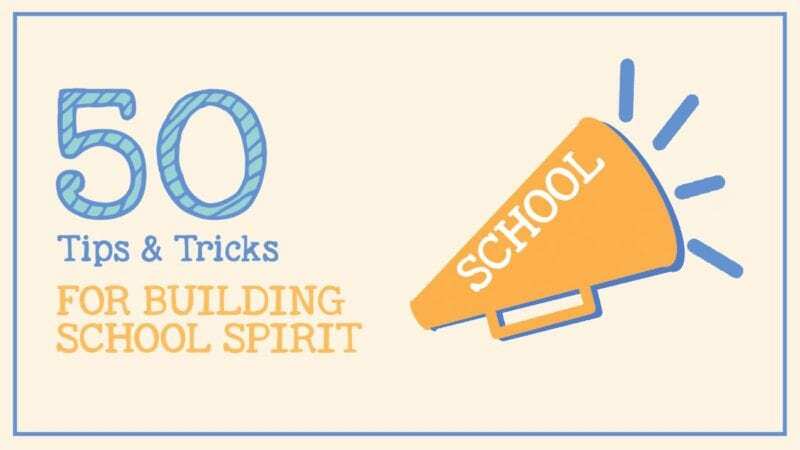 But how do you actually build that elusive thing called school spirit? Here are 50 creative ideas to try at your school. 1. Throw a back-to-school cookout. Get the whole school community together to get “fired up” for the school year. Having time to casually socialize with teachers and staff helps ease the transition for students and families. 2. Face-paint with your school colors. Recruit art students to showcase their talents by painting their peers’ faces with school colors. Schedule it on a pep assembly day to give students the opportunity to amp up the school spirit. 3. Have a school movie night. Spread a king-size sheet or painter’s tarp on the side of the school to project a movie and invite students and their families to bring lawn chairs or blankets. If the weather’s cold or rainy, turn your school gym into a movie theater and spread out the gymnastics mats for seating. 4. Hold a poster contest. 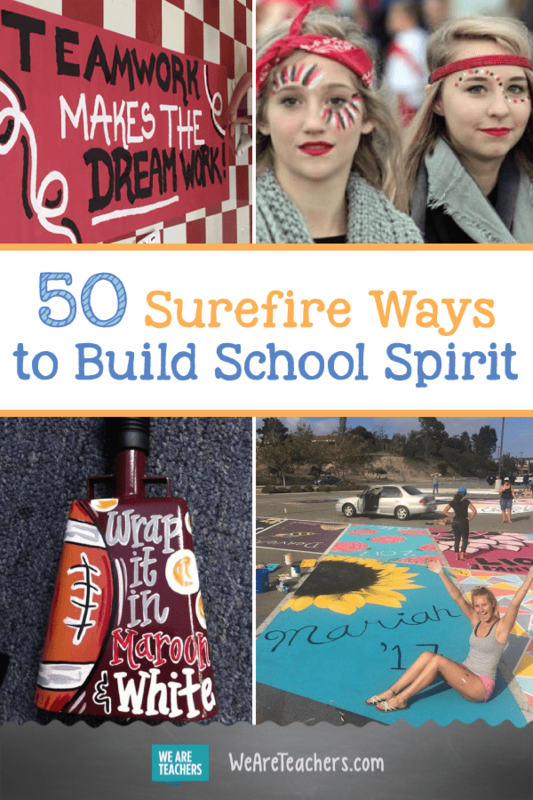 Have different homerooms, school clubs, or teams make their best spirit posters to display in the halls. Present the winning one at a pep rally and reward the artists with small gifts, like school key chains or rally towels. 5. Choose a new school mascot. There are enough mustangs, cougars, and knights out there. Have a contest to pick a new, unique school mascot. Perhaps a flying squirrel, hippo, train engine, or stallion? 6. Designate special dress-up days. Some great ideas include: school colors day, crazy hair day, twin day, beach day, jersey day, favorite book character day, color wars (each grade wears a different color), tie-dye day, and throwback day (dress from your favorite decade). 7. Come up with a school handshake or wave. Use it as a special secret greeting outside of school hours when students and/or teachers and staff meet. 8. Hold a T-shirt-decorating contest. Challenge kids to design a spirit shirt for your school. Feature all entries on a bulletin board in a common area so that everyone can appreciate their peers’ hard work and get excited about the contest. The winner can be decided by popular vote or by a committee vote. Order shirts with the winning design in bulk. 9. Adopt a sister school. Find a school in another state, or even overseas, and collectively write letters to that school. Send your news and school highlights. Post replies where everyone can read them. 10. 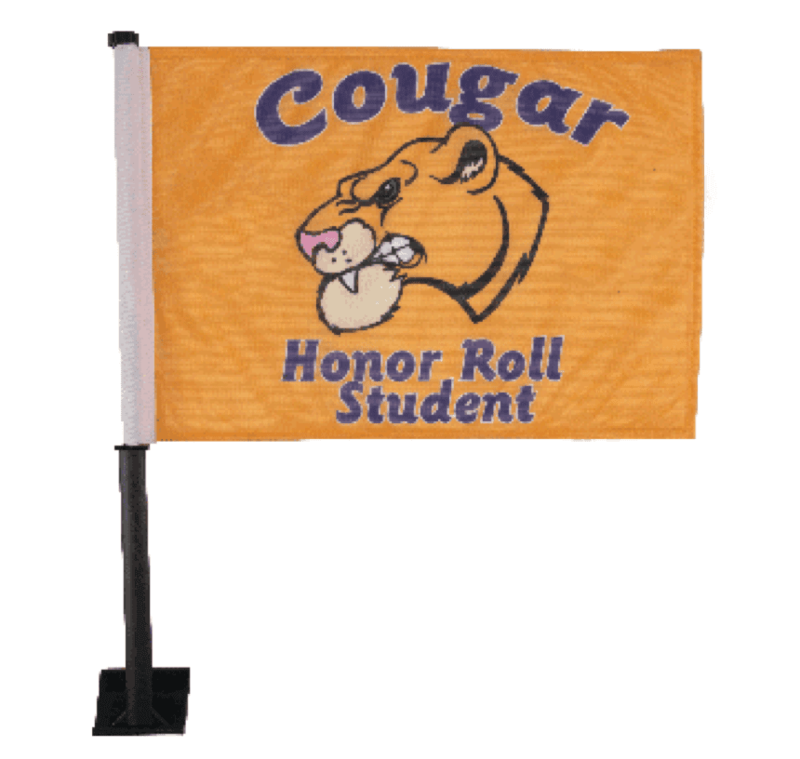 Show your school pride in the hallways. Display art collections, written work, student portraits, awards, and accomplishments, etc. Make it obvious that your school is a special place to be! 11. Have a spirit assembly! Spirit assemblies (or pep rallies) are time-honored events that still work. It’s a time for cheers, music, guest speakers, spirit chants, school songs, free-throw contests, door prizes, and more! 12. Choose an entrance song for spirit events. Get kids fired up with a rocking song that gets them on their feet and cheering. You can make it a classic jam like “Eye of the Tiger” by Survivor or something more contemporary, like “Happy” by Pharrell Williams. Check out these song tips from Education to the Core along with other great ideas for spirit assemblies. Use school colors and letters. Pass them out at lunchtime or at sporting events. Build community at your school by adopting a school bird, tree, food, international city, hero, etc. Let students make the final choice by popular vote. 15. Hold a door-decorating contest. Pick a theme, such as making the world a better place, or a holiday, such as Halloween or Valentine’s Day. Reveal the winning classroom over morning announcements and award the winners with a prize, like extra recess time or a pizza party. 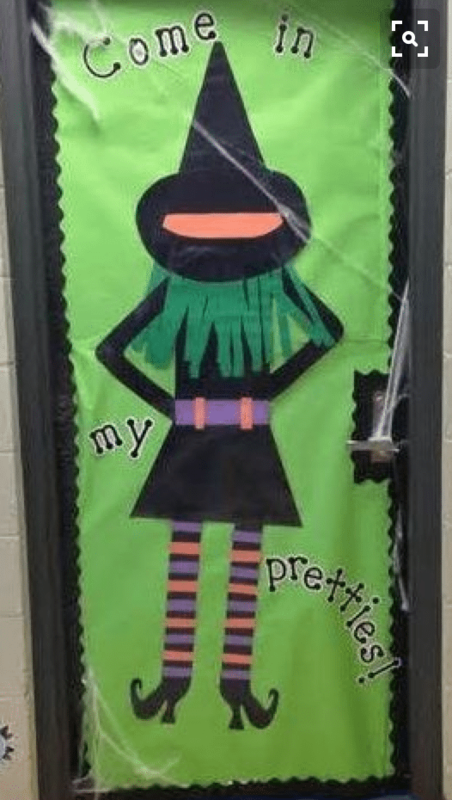 Here are 50 awesome classroom door ideas. 16. Come up with a yearlong theme. 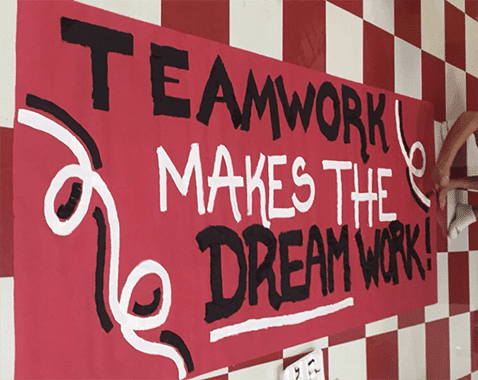 Motivate students and staff with a school theme, like teamwork or respect. Integrate the theme into as many aspects of your school as possible throughout the year. For example, rename your school newsletter and incorporate the theme into your back-to-school night. Read this great article from Education World on how to engage the whole school in a unified, yearlong theme. 17. Order school bumper stickers. 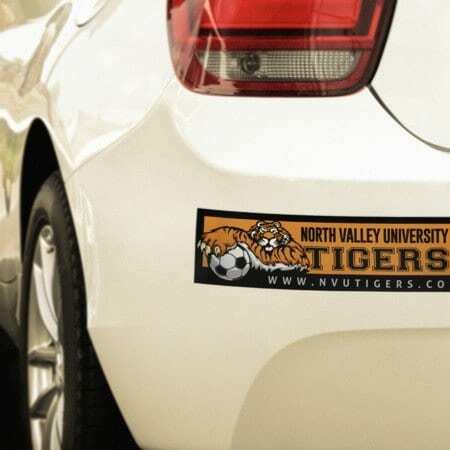 Get the whole town thinking about your school throughout the year by putting your school name on car bumpers and back windows everywhere. 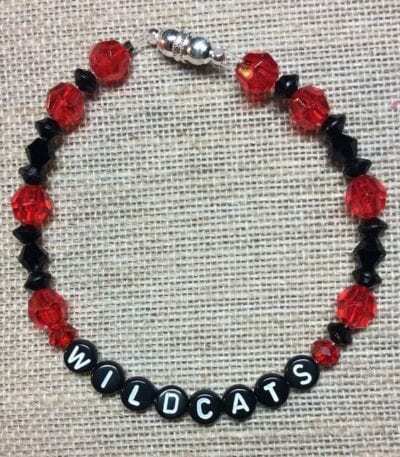 It’s also a great way to let families show their school pride. 18. Slap on some temporary tattoos. Sell them for a quarter for a good cause before pep assemblies or sporting events. 19. Rent a dunk tank. Set a school-wide goal, such as an attendance or citizenship goal, and as a reward, let the kids have a shot at dunking the principal, gym teacher, or other popular person. 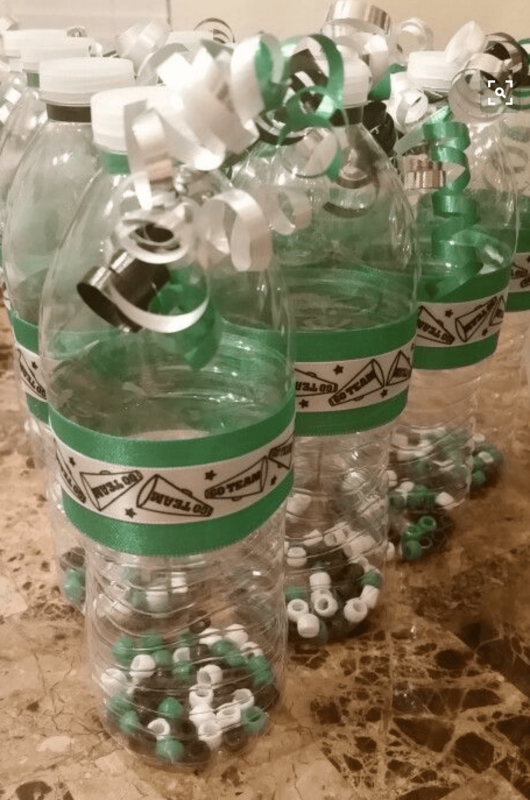 Use liter soda bottles and pony beads in your school colors. Add curling ribbons to the lid and ribbons around the middle of the bottle. Then use them at school pep rallies and sporting events. 21. Give out honorary school diplomas. Honor great citizens, living or historic. Have a rotating committee of students help write the citations, focusing on the qualities that the honoree and your school have in common. 22. Decorate with erasable chalk. Jazz up your school windows or cars in the parking lot with your school letters and colors. 23. Start a mentoring program. Pair big kids with little kids for the duration of the year. “Buddies” can invite each other to lunch (on specially designated days), write notes (monitored), and team up on field day competitions. 24. 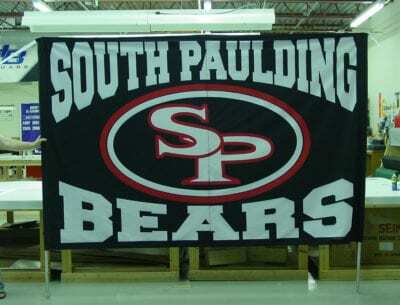 Order a custom banner for your school teams. Display it proudly in the gym or on the field. 25. Designate a school song. A school song is a tradition that will create lasting memories for generations. If you have a talented student or teacher musician, you could even compose an original song. Already have one? Host a contest to update and refresh it! 26. Use a spirit can. 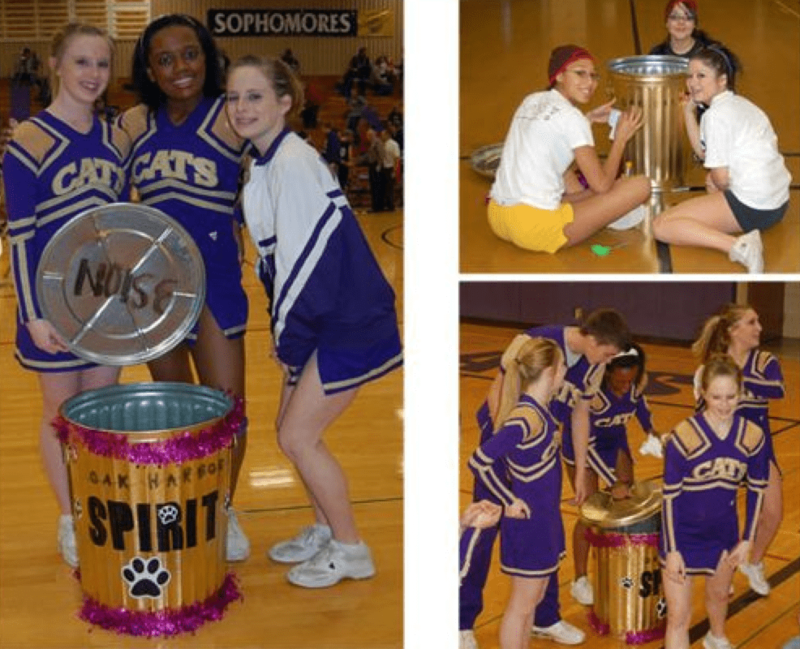 During game time-outs, cheerleaders lift the lid on the spirit can, signaling for the crowd to cheer. The higher the lid is lifted, the louder the crowd cheers. As the lid is lowered to the can, the crowd becomes softer. 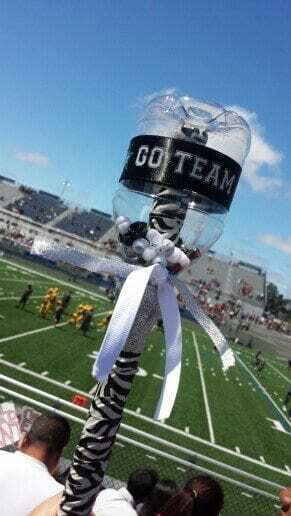 The spirit can holds T-shirts and candy, which the cheerleaders can throw out to the loudest fans. 27. Celebrate your school’s birthday with a giant cake. Get one of the fun cakes with a photo of your school printed on the frosting—everybody gets a piece! 28. Host a photo booth. Design your own “frame” with your school mascot or colors and let kids line up for photos. Post them on your school’s website (with permission, of course). 29. Hold a Halloween bazaar. Upper-grade kids can face-paint little kids, tell ghost stories, and put on puppet shows. 30. Make a team-themed spirit cowbell. 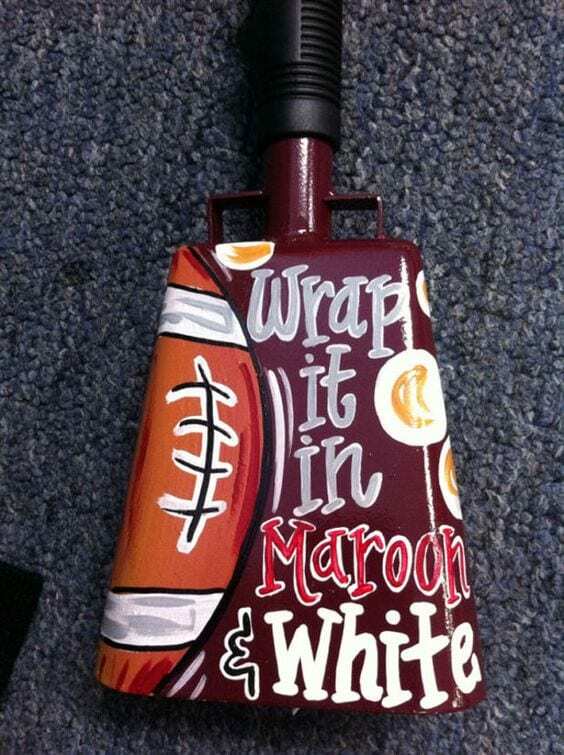 Use craft paint and ribbons in your school’s colors to create a custom cowbell for pep rallies and sporting events. 31. Play a kids vs. teachers sports game. Kids get such a kick out of playing (and possibly beating) the grown-ups. Hilarity will ensue. Personalize them for your sport or activity. Enjoy watching them flap in the breeze all over town. 33. Give out senior shirts to graduating students. During the last weeks of class, invite kids to wear their senior shirts out in the world to proclaim their school pride for years to come. 34. Design a spirit stick. Use an empty gallon water bottle, a broomstick, beads, and ribbon. Award the stick on a revolving basis to the grade or class who shows the most school spirit. 35. Celebrate your school’s history. Make weekly history announcements, include a history column in the school paper, or post a history board in the halls to feature influential teachers, founders, the school’s namesake, and outstanding alumni. 36. Hold a community day. This makes a great annual tradition that builds school pride and stronger neighborhood-school ties. Students, teachers, staff, parents, and alumni get together to give a day of service in the community, whether by cleaning up sidewalks, planting trees, visiting seniors, or serving at food banks. 37. 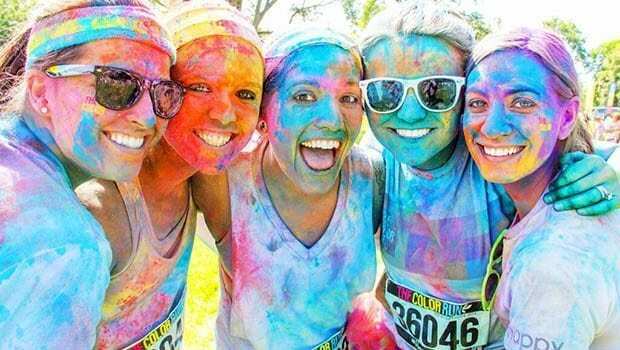 Host a color run. 38. Create a school creed that shows your school pride. For example: We are Eagles. We are considerate. We are responsible. Or create an honor pledge and have students sign it during an assembly ceremony. 39. Have a dance competition. Give kids a chance to show off their dance moves in front of their peers. Call for individual and group performances. It doesn’t have to take a lot of preparation—in fact, it can be an impromptu invitation that happens in the middle of a pride assembly. 40. 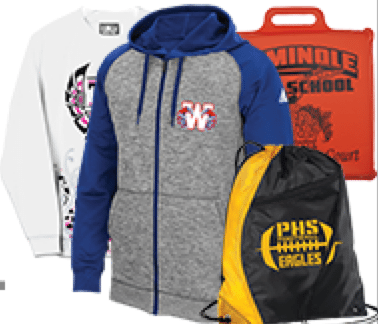 Open a school team–wear store. Sell spirit wear so everyone can get decked out in your school colors. 41. Sponsor a talent show. 42. Create a school cheer. Simple or complicated? It’s up to your school! Make it catchy so that years from now, it will still pop into alumni’s heads and remind them of the good times they had at your school. 43. Participate in challenges with an academic purpose. Sponsor a school-wide read-a-thon, geography bee, or trivia bowl. Share pictures of school events on your school Instagram page or create a Facebook page just for school events. 45. Hold an old-fashioned field day. 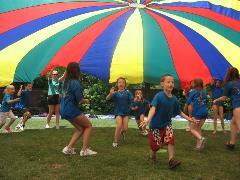 Celebrate your school spirit with obstacle courses, relay and three-legged races, and parachutes. 46. Host a school-wide Amazing Race. Kids go on a scavenger hunt around the school, completing certain tasks. The last team to make it to each checkpoint is out. 47. 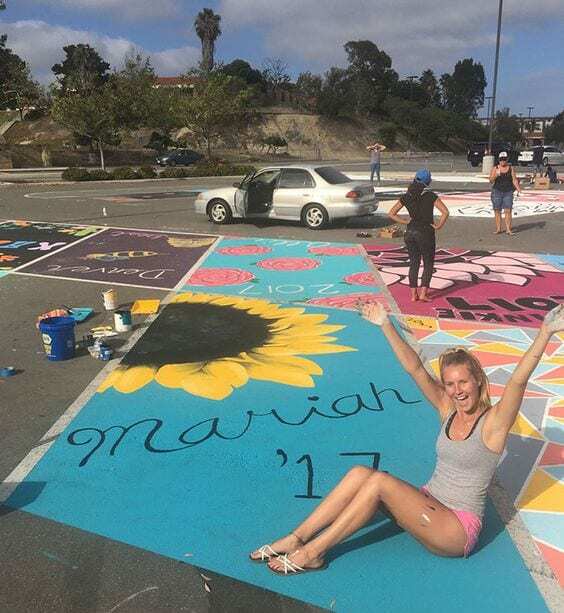 Let seniors personalize their parking spots. Finally, finally! Seniors get to park in the front row. Let them show their pride with a little personalization. 48. Create an acronym for your positive behavior goals. For example, PRIDE: Fireside Falcons are Positive and Responsible with Integrity, Determination, and Excellence. 49. Start a lantern tradition. Hold a special ceremony for graduating students to pass on a symbolic lantern to members of the class below them. 50. Do an end-of-year graduation walk. Graduating high school seniors walk the halls in their caps and gowns to inspire younger students to go the distance. Read this article from ABC News. 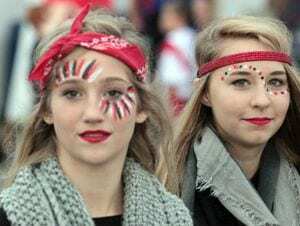 How do you show school spirit at your school? Come share in our WeAreTeachers HELPLINE group on Facebook. Also, check out 49 Ways to Create a Tidal Wave of Kindness in Your School.